Living a Fit and Full Life: Clean Your Home Naturally and Thoroughly with Baby Cloth by e-cloth®! Clean Your Home Naturally and Thoroughly with Baby Cloth by e-cloth®! Since its founding in 1995, e-cloth has rapidly grown into Europe's No. 1 chemical-free cleaning company. e-cloth products began being sold in the United States in 2008. In additional to exceptional cleaning, e-cloth products provide significant cost and time savings and real health and environmental benefits versus ordinary cleaning. Includes one (1) Chemical-free Cleaning Stroller & Car Seat Cloth - 12.5" x 12.5"
e-cloth Chemical-free Cleaning Stroller & Car Seat Cloth cleans with just water, 100% eliminating chemicals sensitivities, allergic reactions, rashes and asthma associated with the use of chemical additives, fragrances and dyes. Unique weave easily cleans spills, food crumbs, dirt and grime from all car seat and stroller parts using just water. Chemical-free Cleaning Stroller & Car Seat Cloth removes crumbs and cleans spills quickly and effectively. Keeps messes and spills from becoming disasters. No chemical residues. Includes one (1) Chemical-free Cleaning Table & High Chair Cloth - 12.5" x 12.5"
e-cloth Chemical-free Cleaning Table & High Chair Cloth cleans with just water, 100% eliminating chemicals sensitivities, allergic reactions, rashes and asthma associated with the use of chemical additives, fragrances and dyes. Specialized grooves in fabric improve cleaning and remove more gunk, crumbs, baby food and hardened messes leaving surface amazingly clean. Perfect for wiping down high chairs after every use creating a cleaner environment for your baby. No chemical residues. 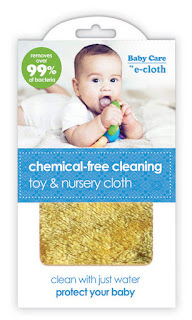 Includes one (1) Chemical-free Cleaning Toy & Nursery Cloth - 12.5" x 12.5"
e-cloth Chemical-free Cleaning Toy & Nursery Cloth cleans with just water, 100% eliminating chemicals sensitivities, allergic reactions, rashes and asthma associated with the use of chemical additives, fragrances and dyes. Extra thick and fluffy fibers easily reach into even the toughest crevices to remove drool, grime and hardened messes from all hard surfaces your baby comes in contact with like toys and nursery furniture. Perfect for cleaning teething toys. Safe for cleaning all toys. Leaves no chemical residues. "Repeated exposure to chlorine bleach has been linked to respiratory damage and wheezing as well as nose and eye irritation. Bleach fumes consist of a complex mixture of toxic, carcinogenic and irritating gases, including chlorine, chloroform and carbon tetrachloride." 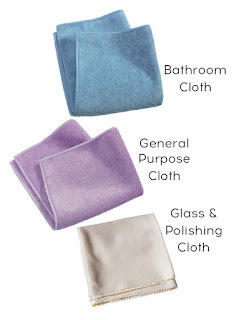 Use with your E-cloth® cleaning cloths wherever you take them. The true chemical free cleaning reduces the use of paper towels and chemical cleaners creating a healthier home environment. Clean Your Home Naturally and Thoroughly with Baby Cloth by e-cloth®! As a mom of 4 I was extremely skeptical about just cleaning with water because we make some pretty tough messes in our house. However, I was completely blown away by how effective cleaning with e-cloth was! Honestly their were so many items that came clean in seconds where as even using tough cleaners would take me awhile to get it clean. e-cloth's Chemical-free Cleaning Home Starter Kit 3pc is amazing! The bathroom cloth worked miracles in my bath tub and shower. e-cloth's general purpose cloth cleaned walls, baseboards, counters and so much more with ease. The glass and polishing cloth has to be my favorite cloth though. I have streaks on windows and mirrors when I clean and usually no matter what I do they appear. This cloth made me look like a pro and with just water! My windows, mirrors and even stainless steal appliances came out looking incredible. 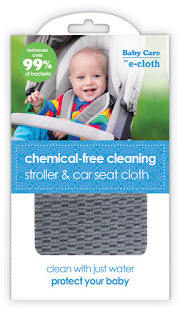 e-cloth's Chemical-free Cleaning Stroller & Car Seat Cloth cleans with ease! I have a minivan and sometimes it feels as if we live in it because my kids eat, drink, color and just about anything else you can imagine in it. Probably needless to say but the car seats are a mess. I mean seriously a mess with stuck on banana on one, sticky candy on another and tons and tons of spills. I used e-cloth's Chemical-free Cleaning Stroller & Car Seat Cloth to clean all of that and everything came out so clean. Normally I have to take the car seats apart and wash the covers in the washing machine to get them clean and if you've ever had to do that you know what a pain putting them back together is. Now with e-cloth's Chemical-free Cleaning Stroller & Car Seat Cloth I can simply wipe them down instead of taking them all apart. What a relief! Works great for strollers too! The Chemical-free Cleaning Table & High Chair Cloth by e-cloth is also fantastic! I have two trays with my son's high chair which a bit of a blessing and a curse because sometimes if one is dirty I use the other and alas we have a stuck on mess on both. 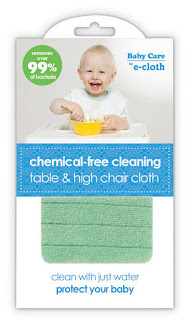 e-cloth's Chemical-free Cleaning Table & High Chair Cloth cleaned it all so easily. The stuck on sticky mess, it all came off without using cleaners or even heavy elbow grease! Amazing! e-cloth's Chemical-free Cleaning Toy & Nursery Cloth is awesome! I thought my kids toys were pretty clean as I regularly clean them but e-cloth's Chemical-free Cleaning Toy & Nursery Cloth proved me wrong. When I got done cleaning the cloth was extremely dirty! The few spots that I found on the toys came off with ease. I also have to add that this cloth gets in the corners and cleans to the fullest. I love this cloth and feel so relieved knowing my kids toys are truly clean now! e-cloth's Water Atomizer seems like a regular old spray bottle but it is not! The mist is extremely fine which helps to prevent streaks and also enables you to clean with ease. e-cloth's Water Atomizer is perfect for use with e-cloth's cleaning cloths and products since they clean with just water. I highly recommend e-cloth's products! They work and they save money because you only need water to clean! Click HERE to find a store near you that sells e-cloth! Click HERE to learn more about e-cloth! Follow e-cloth on social media!